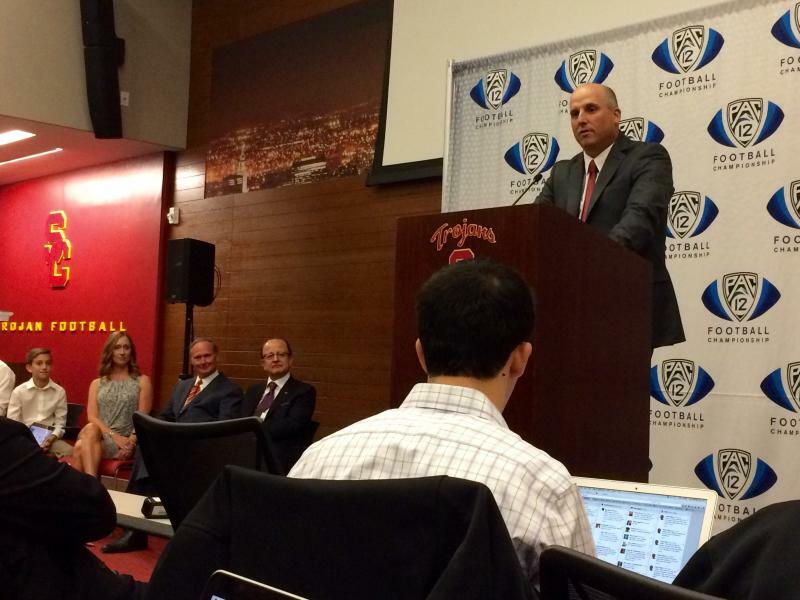 Clay Helton was appointed as the official head coach of USC’s football team on Monday. In signing Helton to a guaranteed five-year contract, athletic director Pat Haden seeks to stabilize any shakiness that may have swayed the team recently. However, Haden said that his success as interim coach was not the sole basis for his decision. “Clay was not hired just because we defeated UCLA Saturday,” he said. “It was a nice win of course … he’s our choice because we believe in him.”Helton, 43, has been working as an assistant for the USC football team for six years. In October, he led the 2015 team to a Pac-12 South division victory in his stint as interim coach, following the firing of former coach Steve Sarkisian. While Helton’s 5-2 record as interim coach may have foretold the possibility of permanent hire, some were surprised that the department chose not to opt for a glitzier, more regarded name in the industry. Among several names in the speculation circuit was Philadelphia Eagles coach Chip Kelly. What do the players think about the decision? Aside from the few who showed up to cheer Helton on in the press conference Monday, many voiced their support on Twitter. In Monday’s conference, Haden discussed the importance of choosing a coach who upholds good relationships with players and understands Trojan family values. 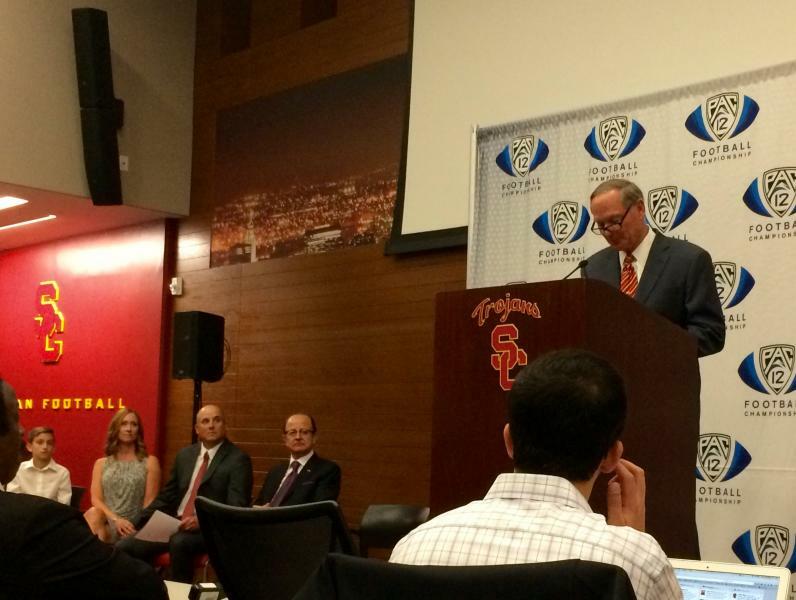 Values, Helton claims, that can only be understood with significant experience as a Trojan insider. And for better or worse, the concept of “keeping it in the family” has certainly been the mantra in recent Trojan football history. Haden, a former star Trojan quarterback, hired Helton, a former interim coach and offensive coordinator under Sarkisian. Haden is also responsible for hiring Sarkisian, a past offensive coordinator under Pete Carroll. Haden’s predecessor, former athletic director Mike Garrett — also a former star Trojan running back — hired Lane Kiffin, who also had previously worked as an offensive coordinator under Pete Carroll. Sarkisian was fired from his position as head coach on October 12, 2015, after making a slurred, obscenity-laced speech at a pep rally and failing to appear in practice. He later admitted to have been struggling with alcohol abuse. Despite the heat Haden received for the Sarkisian situation, he decided to preserve the internal tradition by hiring Helton. “After weeks of searching the collegiate and professional ranks, interviewing several candidates and speaking with head coaches, athletic directors, NFL executives, and very knowledgeable football people, and after observing Clay in action the past several weeks, it became abundantly clear that what we are searching for in a coach is right here in front of us,” said Haden in Monday’s conference. On Saturday — just five days after the official announcement — Helton will lead his team of Trojans to Santa Clara for a Pac-12 championship game against North Division titlist Stanford. Reach Staff Reporter Maddie White here.